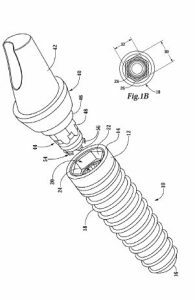 A US patent has been issued to Biomet 3i for an implant which features two anti-rotational elements. One anti-rotational feature is adapted to engage a driving tool, while the other anti-rotational feature is adapted to engage an abutment. An implant abutment system is provided with an angled abutment adapted to mate with one of the anti-rotational features. A second, straight abutment is adapted to engage with the other anti-rotational feature. An abutment is provided with resilient fingers to interface with the implant and provide tactile and audible feedback indicating when the abutment is properly seated. An abutment screw extends through the abutment and engages the implant bore distal of the stem of the abutment. The abutment screw limits axial movement of the abutment relative to the implant. A driving tool comprising one of at least retention structure and visual alignment indicia is provided to facilitate screwing the implant into a patient`s bone.